Feb. 28, 2013, 10:35 a.m.
By Joshua Benton @jbenton Feb. 28, 2013, 10:35 a.m.
It’s Episode 8 of Press Publish, the Nieman Lab podcast! Our guests this week are Harvard Business School professor Clay Christensen and David Skok, the director of digital at Globalnews.ca in Canada. Normally, episodes of Press Publish feature me having an extended conversation with someone doing interesting work in journalism innovation. This one’s different — it’s actually a recording of an event we held here at the Nieman Foundation last night. Does Clay Christensen really need an introduction at this point? Once you’ve been named the top management thinker in the world, I imagine not. Clay is the man behind disruptive innovation, the theory of how industries respond to technological changes that alter access to products or services. His book The Innovator’s Dilemma is one of the most influential business books of the past two decades, and his Newspaper Next project in 2006 provided an alternate vision of what a more agile U.S. newspaper business might have looked like. Last night, David came in from Toronto and Clay came in from across campus to talk to a crowd of about 70 about technological disruption in journalism. They were in conversation with Nieman Foundation curator Ann Marie Lipinski. It’s a great framing of disruption and definitely worth a listen. Oct. 2011: “The path of disruption: Did Newspaper Next succeed in transforming newspapers? Photo of Christensen by World Economic Forum used under a Creative Commons license. POSTED Feb. 28, 2013, 10:35 a.m.
Benton, Joshua. 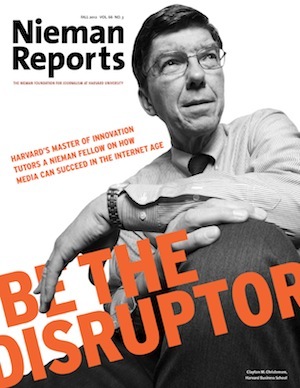 "Press Publish 8: Clay Christensen on the disruption of journalism." Nieman Journalism Lab. Nieman Foundation for Journalism at Harvard, 28 Feb. 2013. Web. 23 Apr. 2019. Benton, Joshua. 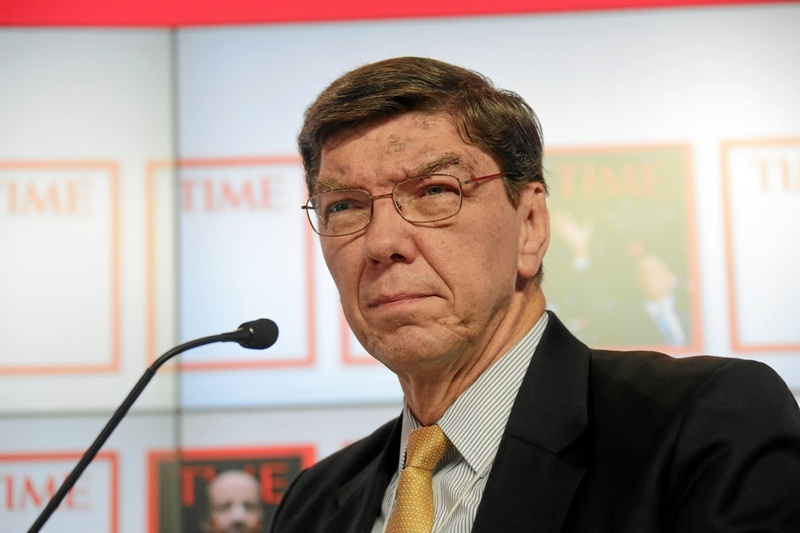 "Press Publish 8: Clay Christensen on the disruption of journalism." Nieman Journalism Lab. Last modified February 28, 2013. Accessed April 23, 2019. https://www.niemanlab.org/2013/02/press-publish-8-clay-christensen-on-the-disruption-of-journalism/.